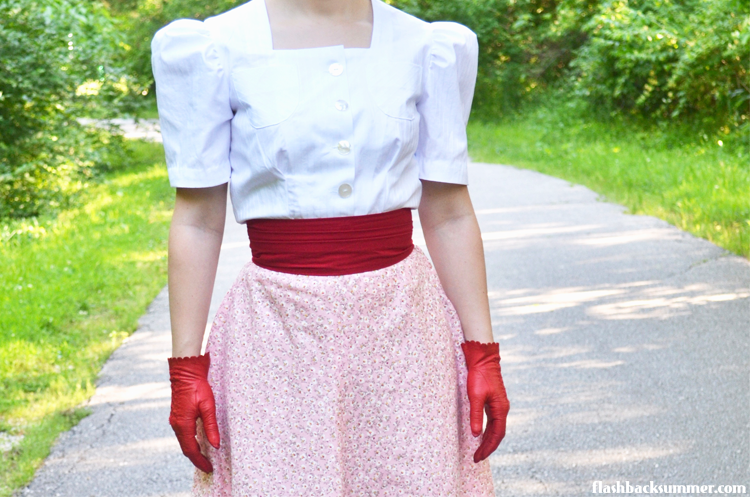 Although I'm not typically a fan of the late 1930s puffy sleeve look, I think it would be flattering on a lot of people. ("The bigger the sleeves, the smaller the waist," right?) The skirt, too, is fuller than I thought from the pattern illustration. It's probably a little bigger than a half circle and is quite swishy! I like the kind of dirndl-y feel of the blouse as well. 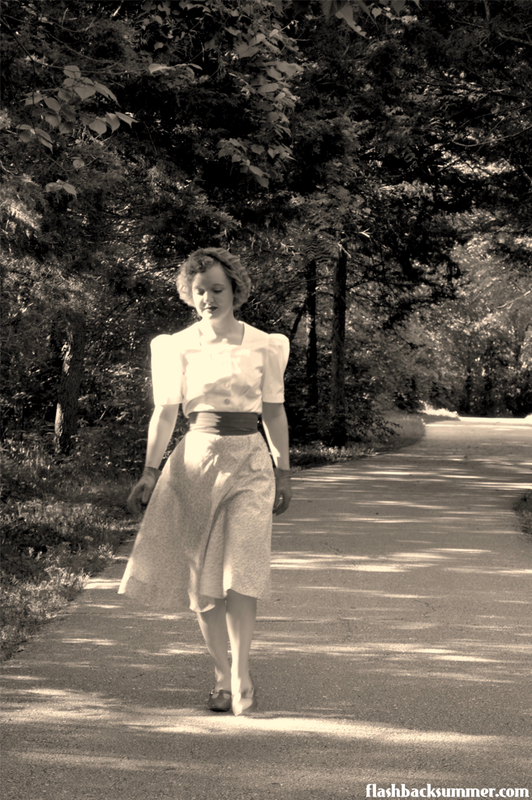 Germanic/traditional European inspirations were a source of fashion inspiration in the U.S. in the mid to late 30s, and this fits in with those. I really like the square neckline and the fit. The pleats release right below the bust to create a fitted waist, and the blouse really does look good tucked in or left out as the pattern illustration shows. I would love to retry this in a more formal fabric. Though I may opt for a less puffy sleeve next time, the blouse and skirt would look amazing in taffeta, satin, or velvet, I think! I can totally see a Schiaparelli-inspired ensemble with some couture embellishment on the blouse. How historically accurate is it? It's all spot on! 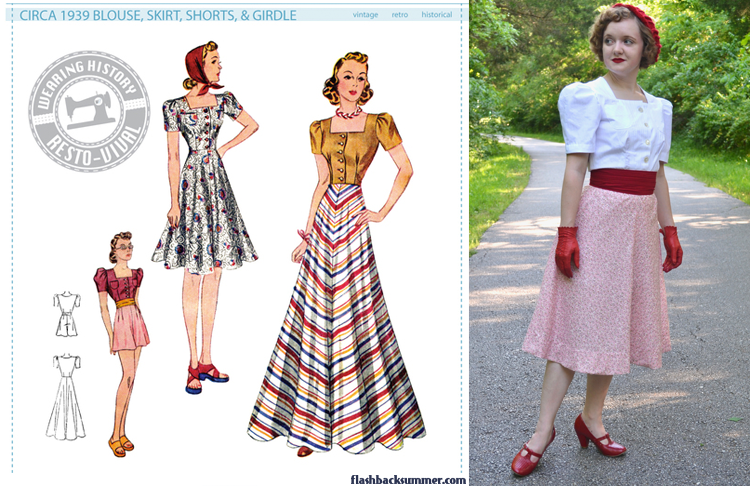 I have an original vintage pattern from the 1930s and it's very, very similar. Any tricky parts to the pattern? The neckline is a little origami-ish to put together, but if you follow the directions you'll make it through! I also found the waistband of the skirt tricky, but Lauren pointed me to this tutorial on her blog that uses the same kind of waistband that I can refer to next time. Did you change anything? I did not! Time to complete: a couple of days. The shirt has a lot of little steps that, while not hard, do add up! Total cost: I got all of the fabrics and notions from my stash, so honestly... who knows? Notes: You may notice the buttons on the blouse are a bit off center. I moved them over to tighten the blouse and narrow the neckline. Next time I'll remove an inch or two from the width of the blouse at the bust and shoulders to fit a bit better. I received two WH patterns in exchange for finished garment photographs, but this blog post was made of my own accord and feature my own honest opinions! For more information on my collaboration standards, check out my policy page. 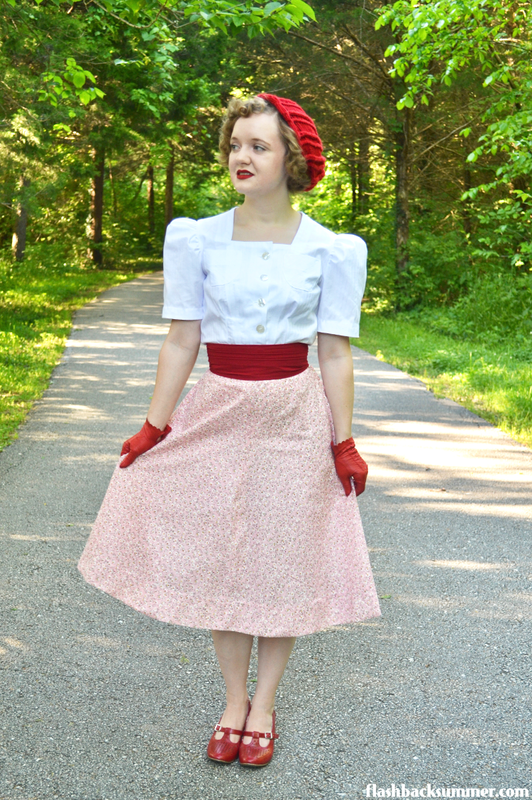 How do you like wearing the girdle/belt and was it easy to make? I'm struggling with wanting more belts at the moment, but not wanting either leather or pvc and that is surprisingly very limiting! I really like the look of this one, so nice and wide. It might be just the pattern I need!! I actually really like this one. It's really flexible, and it's gathered at the back to give the cummerbund look. It's closed at the back with hooks and eyes and quite easy to make! Thank you Emileigh! That's very helpful information. I think I'll have to try it! Oooo, a lobster! Great idea!